Just as people are individualistic, so are sweet potatoes. No two sweet potatoes are the same. The more time and effort lavished on them, the more tasty sweet potatoes become. 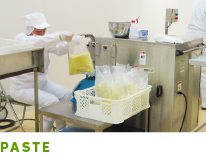 That's why we insist on "working by hand" from production of the raw material to processing and sales. 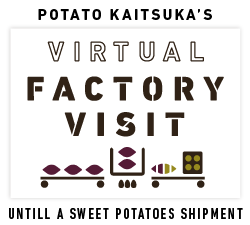 Please join us in a "sweet potato journey" up to the shipment of the potatoes. Tasty sweet potatoes have been harvested. These will be collected at Potato Kaitsuka and sent to all corners of Japan. Temperatures in the morning and night differ largely in areas close to the sea in Ibaraki Prefecture. Because of this, sweet potatoes cultivated here have a high sugar content and are very sweet. Just harvested some tasty sweet potatoes! We're at work collecting the potatoes. This was collected from a farm. These cartons are full of sweet potatoes. The collected sweet potatoes undergo curing. 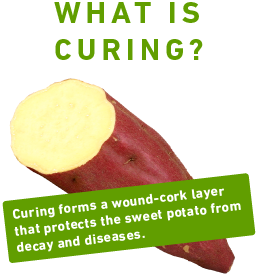 Curing is a process that allows the sweet potatoes to maintain their taste for one year. Sweet potatoes harvested in the field are stored according to producer and variety in a storehouse that can hold about 5,000 tons of potatoes. Following that, the temperature is rapidly dropped to 12 - 13 deg C and the potatoes are matured for one year at that temperature. 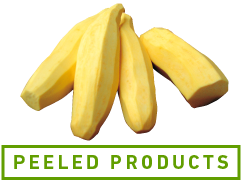 The sweet potato can maintain temperature and humidity through curing. 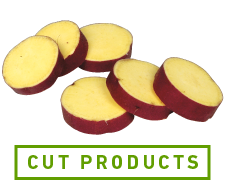 The skin of the sweet potatoes becomes a little dark, but it protects it from disease or decay, reduces sprouting, and further increases the sugar content. A pressure washer, using water only, is used to wash the sweet potatoes. These are placed in containers and left to dry. The producer also washes the sweet potatoes, and manages the condition and volume of the potatoes. The potatoes are carefully washed by water pressure, and advanced to the next stage. The containers are also washed in preparation to accept the potatoes. 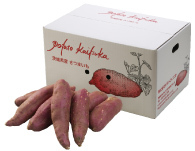 The sweet potatoes are sorted by size, shape, and variety, and are packed in boxes while visual inspections are also conducted for decay and other problems. Each of the washed sweet potatoes is carefully peeled by hand. 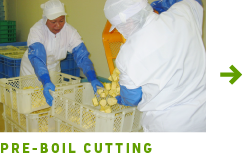 The peelings are placed in a separate container and taken away for use as pig feed. 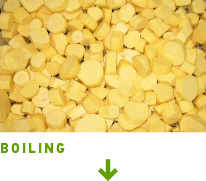 potato is peeled by hand! 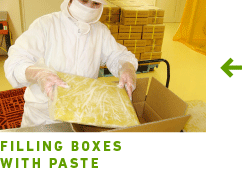 Many steps are necessary to make paste. Baked sweet potatoes are baked for a long time in an exclusive gas oven. The sweet potatoes are now ready to be shipped out. See you later!